The iFastViewer app lets you attend FastViewer sessions from the comfort of your iPhone, iPod touch or iPad. Even if you’re on the go, you no longer have to miss out on presentations, web conferences, online meetings or training sessions. See your meeting partner’s desktop. You can view it in fit-to-screen mode or zoom in and use multi-touch functions, like pinching your fingers together or apart, to smoothly scale the display size. When remote control is enabled, the mouse cursers movement is now relative to your fingers movement. 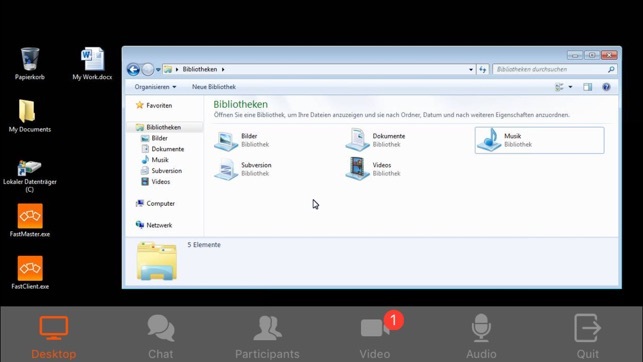 Tap on the camera icon to see video images of all participants in a meeting with a webcam. If your device has a camera, you can even transmit your own video image. 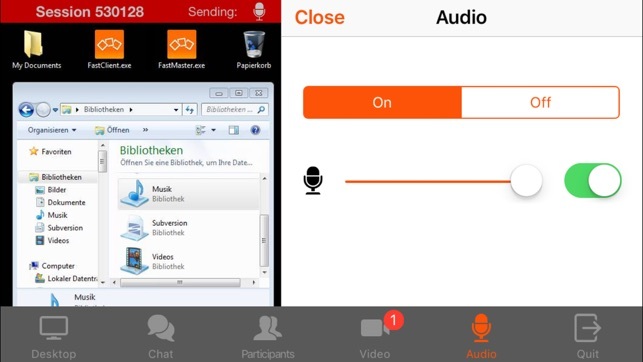 Navigate on the iFastViewer app to the "audio" tab: Here you can dynamically activate and deactivate your speaker or microphone to participate in the sessions voice communication. The chat function also lets you join in discussions even when you’re not at your desktop. The list of participants lists all of a session’s attendees. You can also see who’s sharing their desktops. As moderator you can manage the participants and control who is sharing and in remote control as well. FastViewer lets you view and participate in presentations, meetings and training courses online – all in a secure and easy-to-use environment. And it’s also certified by Germany’s TÜV SÜD certification organization. - Info: The iOS Screen has to be shared again, if screenlock activated. - Info: New tutorials are available for iFastViewer screensharing (setup & how to use). Those will be displayed if iFastViewer is selected for screensharing by a master. Start iFastViewer App, if the iFastViewer App is selected for screensharing: Swipe to open control center and longpress / 3d touch the record button, select iFastViewer for screen sharing. Einfache Bedienung und sofort an Meetings mit teilnehmen. Wäre schön wenn man noch Teilnehmer über den Konferenzplaner per E-Mail einladen könnte, sodass man die App auch zum Planen von Meetings nutzen könnte. Diese App. Ist leicht zu verstehen und schnell zu bedienen! Gerade für den Außendienst können vom WEB-Collaboration-Moderator eingeleitete Konferenzen auch an entlegene Standorte (Auto, Raststätte, Segelboot) aktuelle Charts, Bilder etc. an das Tablett übertragen werden. Leider können vom iPad keine Screen-Shots gesendet werden. Der Aufbau geht schnell. Bitte noch ein neues Release zur vollständigen Möglichkeiten vom iPad.